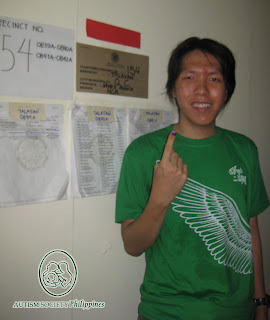 May 10, 2010 is a special day for me because it’s my first time to vote in the (presidential elections, legislative elections and local) elections. Compared to previous Synchronized Barangay and Sangguniang Kabataan (SK) elections, this time it is more high-tech and hassle free. Before coming to the polling center, I memorized the candidates of my choice. I also brought along my PWD ID and COMELEC ID (temporary). And just as a precaution, I also brought a copy of RA 7277. As early as seven o’clock, I saw a lot of people outside the school, our polling place. When the gate opened, we were made to queue up. Since I already knew ahead of time the precinct and cluster number from the documents posted, I went to my polling line. The only delay was in the verification of other voters’ documents, which took bulk of the time, about more than one hour. Stools were provided for all certified voters’ convenience. This idea is very practical and orderly. The election process is very disabled friendly because instead writing all the names of the candidates, I simply shaded the ovals of my chosen candidates in my ballot. Afterwards, I fed the ballot to the PCOS machine. When the machine validated my ballot and read “CONGRATULATIONS,” I felt relieved that my ballot was counted. After I had my thumb printed and signed my name on the records, I made sure that the election officer put the indelible ink on my right index finger. The whole election process took less than 10 minutes. I am glad that voted for the persons that I trust will protect my rights as an autistic person and bring discipline to the people. 1. Acquaint the PWA with the candidates and their platform and accomplishments. 2. Give your PWA references on how to vote, from newspaper clippings or videos from the internet. 3. Simulate in a room with no people. Prepare a table and a chair. Make signs such as steps on how to vote, and placards “silence”. 4. Give him a sample ballot and practice shading until he masters. Note: It is necessary to tell your PWA to vote for those who are trustworthy; PWD friendly, those who advocate and have the heart to help persons with autism. JR Tan is 19 years old and an incoming third year college student. He is passionate about PWD rights and dreams of becoming a CPA in the future.